In this chapter we describe the various analysis modes available and how to set them up from the schematic editor. There is more information on analysis modes including full details of the netlist commands to invoke them, in Simulator Reference Manual/Command Reference. You can also enter the 'raw' netlist commands in the F11 window. The contents of this window remain synchronised with the Choose Analysis dialog box settings so you can freely switch between the two methods. 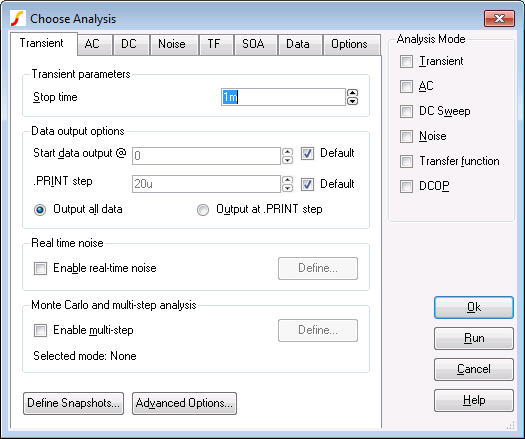 The Choose Analysis dialog box does not support sensitivity and pole-zero analysis so these methods must be set up using the F11 window.